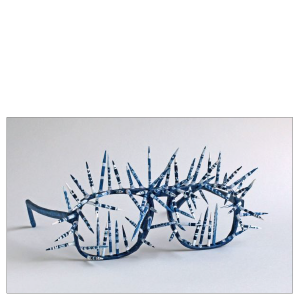 Perspectacles are mixed media sculptures the size and shape of eyeglasses. As I create and photograph them, I explore renewal of the ways we see (or don’t see), offering a place to reflect and find deeper understanding of ourselves and each other. The work offers an invitation to see beyond what has been. See the journal with artistic photography of the Perspectacles and plenty of room for writing and reflection. Real joy is exuberantly fearless. Sometimes what is truly important becomes clear in a single moment. Inspired by a friend’s new commitment to family after her grandson’s close call with a peanut. The way through is not always what we think it will be. Compassion weeps with us when we weep. This was made for a friend mourning the loss of her brother. There are so many gifts to discover in life and in others. Life around a short temper can be tense and unpredictably explosive. Note the piece of sandpaper over the nose. These Perspectacles are built on 3-D movie glasses - because seeing with eyes of thankfulness can take us to a different dimension. Where is it time for you to bloom? Where do you need to walk carefully? Creativity has its own life-giving way of bursting forth. What happens when a life goes uninhabited? How do you make sure people don’t get too close? We can always choose not to see what is right in front of us. What happens when we do that for a long time? Reconciliation is a fragile, brave, and often messy process. An argument begins on the ends of both earpieces, slowly progressing towards a good repair – a reconciliation – in the middle. Each tear is beautiful, even when we feel barely stitched together and it’s hard to stand tall. What cloud do you need to get out from under? Isolating ourselves from pain only leaves us lonely and unknown. Joy is an intentional awareness. Confusion can settle into the mind like an obscuring fog. This poem is woven through the Perspectacle, partially obscured. Waiting can feel like a prison, especially in our culture of instant everything. How do you see the world when you are scared? 6″x6″x2″, mixed media: recycled eyeglass frames, glass, collaged paper images of an ice cap in Peru. Our selfishness is more obvious than we realize. All images ©2019 Wendy Lew Toda, all rights reserved.